In chemical process synthesis, the heat integration between hot and cold process streams reduces utility consumption and improves energy efficiency, especially when it is carried out simultaneously with the synthesis of the process. Accordingly, we develop mixed-integer nonlinear programming (MINLP) optimization models to address simultaneous process synthesis and heat integration. For example, we recently developed a model that accounts for unclassified process streams, a feature that arises in superstructure process optimization (see Figure 1). The model accounts for (1) streams that cannot be classified a priori as cold or hot, and (2) variable process stream temperatures and flow rates. We employ binary variables to represent the cold/hot stream “identities” and, to handle variable stream conditions, we construct “dynamic” temperature intervals using an implicit ordering of stream inlet temperatures. The proposed model is not only capable of handling isothermal streams and multiple utilities, but also able to deal with process streams with potential phase changes. The proposed model can be integrated with a process design model to allow simultaneous process synthesis and heat integration (see Figure 2). Figure 1. 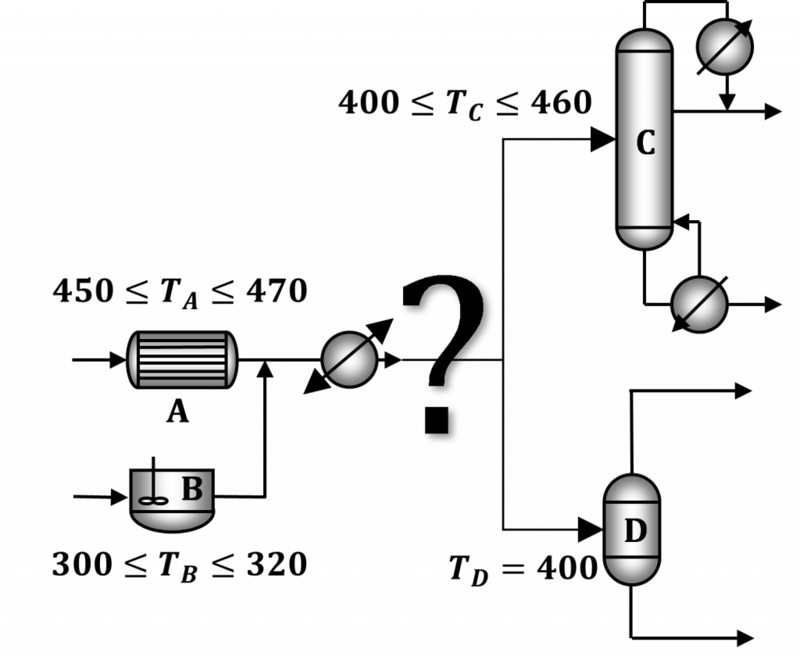 An example of an unclassified hot/cold process stream in a process superstructure. Only one reactor and one separator can be selected in any feasible solution. Figure 2. Integrating process synthesis and heat integration.